The ongoing 2019 Australian Open is set to come to an end as there is just one day and two matches left in the tournament. On day 13, Naomi Osaka created history by winning the Women's Singles Championship and became the first woman since Jennifer Capriati in 2001 to win two consecutive Grand Slams. But, it wasn't easy for Osaka as eighth seed Petra Kvitova gave the Japanese a run for her money and pushed her to three sets before she could eventually lift the trophy. Osaka has herself to blame as she had three championship points in the second set but she squandered all of them before conceding a break and then the set to Kvitova to take the game into the deciding set. In the decider, the fourth seed found her mojo back as he played some brilliant tennis to seal the match and the championship winning 7-6 (2), 5-7, 6-4. Following Osaka's successful Grand Slam defence, top seed Novak Djokovic will look to repeat the same as the 2018 US Open champion will take on second seed Rafael Nadal in the all-important Men's Singles final which will be played on day 14 and bring the two-week long tournament to an end. The battle between the top 2 seeds will be the second match on Rod Laver Arena as fifth seeds Nicholas Mahut and Pierre-Hughes Herbert will take on 12th seeds Henri Kontinen and John Peers in the final of the Men's Doubles which will get underway at 3 PM AEDT (9:30 AM IST). 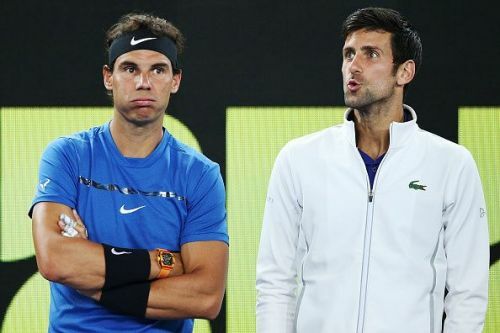 The most anticipated clash between Nadal and Djokovic, who are easily the best players in the men's division, will start at 7:30 PM AEDT (2 PM IST). You can find the full schedule of day 14 of 2019 Australian Open here.